Leaving a gift in your Will to Medical Detection Dogs will cost you nothing today, but will help us to achieve our goals in years to come – making a real difference and saving and changing lives. 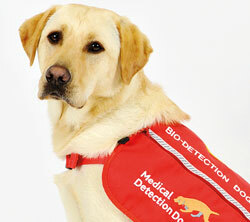 Medical Detection Dogs saves and enhances lives by training specialist dogs to detect the odour of human disease. Our work helps people in two ways. Our Bio-detection dogs are trained to detect the odour of volatile substances in urine, breath or sweat samples and have the capacity to provide a second line test for cancers that are difficult to diagnose reliably. Our Medical Alert Assistance dogs are trained to assist individuals who manage complex medical conditions, such as diabetes, on a day-to-day basis. 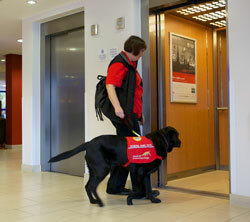 Every day our specially trained dogs help people to live a healthier, more independent life. People like Claire. Magic’s support to Claire was only made possible by the generosity of people like you. Many people receive the life-saving support provided by our specially trained dogs, but hundreds still await their own Magic. All our work is funded by donations. By leaving a gift in your Will to Medical Detection Dogs your kindness, compassion and love of dogs will enable us to help people in a similar position to Claire by expanding our training programme. Your gift will create the potential to help thousands in the future. Your gift will also help fund Medical Detection Dogs’ world-leading research into the early detection of cancer and other diseases by training dogs like Kiwi. Kiwi is a specialist prostate cancer detection dog. She detects the presence of the disease in clinical samples. For us to continue to push forward the frontiers in the detection of cancer and other life-threatening diseases, we need more dogs like Kiwi. We can only achieve this with the kind and generous support of people like you. Dogs that we train to detect cancer, Parkinson’s disease, malaria and other infectious diseases have the potential to make a huge impact on the detection and diagnosis of these diseases, which affect millions of people worldwide. The potential scope of our work is immense, and your gift will help ensure that we can move this world-class research forward. In doing so you will help to make a positive impact on the lives of many. As a charity, we rely solely on the goodwill and donations from people like you. Your gift, large or small, is important and would continue to make a difference. We know that when you make a Will, your priority is to provide for your loved ones. But many people find that even after they have done this, they can leave something to causes that they hold dear. Make a list of everything you own, including property and investments, and decide who to name as executors. These are the people who will make sure your wishes are carried out. Decide who to include. For many people, loved ones will come first, but then you might also like to think about leaving a gift to a charity. Use a solicitor to write your Will so that the legalities are properly covered. To add Medical Detection Dogs as a beneficiary, talk to your solicitor about updating your Will, or completing a codicil and storing it with your Will. If you want to write or renew your Will, you can request a FREE no obligation home visit from a professional Will counsellor. All Wills prepared by the Goodwill Partnership are provided by a panel of solicitors who specialise in estate and probate law and are regulated by the law society. If you have a family to local solicitors, why not call them now and arrange an appointment to discuss what is involved. If, as part of your discussions with them, you decide to leave a gift to Medical Detection Dogs just let them know and tell them our registered charity number 1124533 in England and Wales or SC044434 in Scotland. A gift of £29,000 would enable us to offer a life-saving dog to someone like Yasmine who has a life-threatening nut allergy and cannot enter a room without the reassurance of knowing Nano has ensured it is safe to do so. A gift of £25,000 would pay for two Bio Detection dogs with ongoing support to detect a range of cancers and other diseases. A gift of £60,000 would help to pay for more highly qualified and experienced dog trainers without whom we would be unable to deliver any of our life-saving and life-enhancing support or undertake our ground-breaking research. 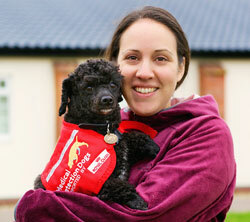 A gift of £130,000 would fund and provide the ongoing support of 10 Medical Alert Assistance Dogs for one year; a dog like Nimbus who is partnered with Jodie who suffers from PoTs and could collapse without warning at any time during the day or night. A larger gift would enable us to expand our work, help complete our on-going disease detection studies and reduce our 18 month to 3 year waiting list by training more life-saving assistance dogs like Simba. Every gift matters and every gift helps to save and change lives. A residual gift – the gift of all (or part) of the value of your estate after debts liabilities and other gifts have been paid. Gifts to charitable organisations are exempt from Inheritance Tax, so leaving a gift in your Will not only helps us without work, but normally reduces your inheritance tax liability as charity donations are deducted from the value of your estate prior to taxation. For all tax advice, we would strongly recommend talking with your solicitor. 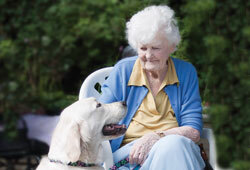 Diana had a passion for life and dogs, but lived and often struggled with diabetes. 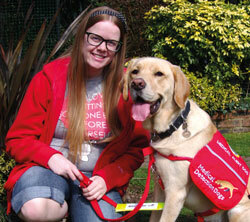 This combination helped her to understand the importance of Medical Detection Dog’s work. When her own health became too difficult to manage, my aunt moved into residential care where, sadly, she could no longer have a dog of her own. She treasured her memories and never forgot how her own dogs had given her independence, companionship and confidence. This made my visits with my Medical Alert Assistance Dog, Kiska, even more special and happy. I also have diabetes and my aunt could see the difference Kiska was making, not only to my own life but to that of my family. My grandfather died from cancer at a young age. This was another reason why Diana so valued the work of Medical Detection Dogs and chose to support them by making small donations during her lifetime and remembering them with a gift in her Will. I know she would ask you to consider doing the same and thus help save lives. 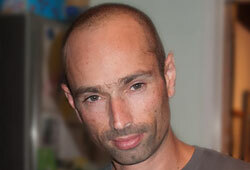 James was a very much loved brother, uncle and son who sadly passed away following an illness in 2012. James wanted his legacy to make a difference. He had some time to consider his will before he died and asked his family to donate money on his behalf to charities of our choosing. My daughter Libby (his niece) asked if we could donate money to Medical Detection Dogs as she has Type 1 diabetes. 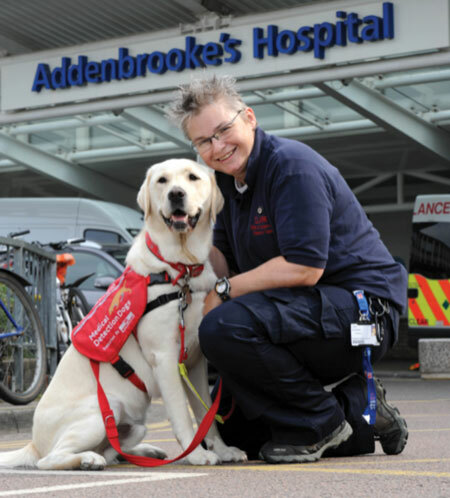 She is fortunate to be cared for by the excellent team at Addenbrookes hospital and has had the opportunity to meet Magic, a Medical Detection Dog working with a member of the charity’s team. We can see what a difference Magic makes. Fortunately, at this point Libby can manage her symptoms, but we know how very important Medical Detection Dogs are in allowing people with such conditions to continue to live life fully and safely. Mike achieved his goal and combined this with his love of dogs. Whenever Mike visited his patients he always took his Labradors with him, something which his patients still remember with fond memories. 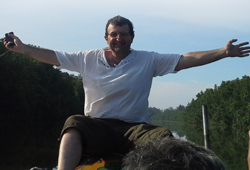 When Mike passed away, we knew that he would want his legacy to make a difference. I had seen Medical Detection Dogs on the BBC and thought the work that you did was amazing. But it was only after Mike died I remembered the charity and thought it was perfect legacy for Mike as it summed up his love for animals and saving lives. As a family, we are very proud of Mike and all that he has achieved and it has been a real comfort to see his money being put to such fabulous use. Legacy giving is the greatest gift I could give in celebration of Mikes life. 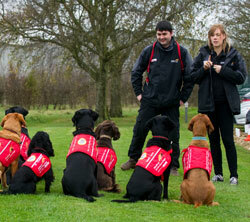 It is wonderful to be a part of Medical Detection Dogs and their exciting journey. On average, it’ll cost between £80 and £150 to arrange a new Will, which is a small price to pay for such an important document. A well-written Will can help make sure your loved ones don’t pay any more Inheritance Tax than they need to, and can avoid any expensive legal complications later. Inheritance Tax is a tax that is charged on the portion of your estate that exceeds a certain level at the time of your death. A gift to charity in your Will could reduce your liability. The current threshold (as of June 2011) is £325,000. If the value of your estate, including your home, is above this, you’ll have to pay the current 40% rate Inheritance Tax on that additional amount. Since 6 April 2012 however, your Inheritance Tax rate will be cut to 36% if you leave at least 10% of your estate to a registered charity. A change in your financial circumstances. A codicil is a simple way to make specific changes or additions to your Will while leaving the remaining provisions untouched. For example, if you decide to add a gift to Medical Detection Dogs to your Will, a codicil is a simple and inexpensive way to do this. You will need to ask your solicitor to draw a codicil for you. What wording should I use to include a gift to Medical Detection Dogs in my Will? We strongly recommend you have your Will drafted by a solicitor to ensure your wishes are properly carried out. I want to leave a gift to Medical Detection Dogs. What are the charity’s details? A charity registered in England and Wales (1124533) and Scotland (SC044434).